Although I’m a certified fashion gal, managing luxury brands by day and blogging my night, I wasn’t always so passionate about fashion. Before I discovered Tom Ford, Nicolas Ghesquiere and Mary Katrantzou, I used to be a real beauty girl, learning about amazing products on forums and obscure websites way before blogs even existed. I’ve been a skincare junkie for over a decade; I’ve given myself facials since I was 15 and have a bunch of facemasks and creams in my essential arsenal. The one part of my beauty regime that I neglected was my body. A few months ago, I began to rethink my lazy stance though. To celebrate turning 30 earlier this year, my friend Isa persuaded me to participate in Notting Hill Carnival. As in, in costume, i.e. a sparkly bikini and a head dress. It seems like a good idea at the time so I agreed and a group of us put our deposits down then swiftly put it to the back of our minds. But as the date crept closer, I started having a bit of mild anxiety about being THAT naked, on the streets, in front of tens of thousands of people. While I never have anxiety over hitting the beach on holidays or pulling on a pair of denim cut offs in summer, I began to feel quite anxious about baring pretty much all on the street. When I was 15, I suffered from severe eczema; it was triggered by stress and a dairy allergy that I didn’t know I even had. For those who aren’t familiar, eczema is a skin condition which causes skin to become itchy, red, cracked, blister and weep. My eczema was top-to-toe and so severe that I missed several months of school. It was such an aggressive bout and my skin was left with red patches, discolouration and scars pretty much from top to toe. It’s safe to say I kept myself pretty covered up as I was so self-conscious about my skin. Over time I made my peace with it and of course the scars faded but I still have uneven skin tone and discolouration. It hasn’t bothered me for a long time but the thought of stripping off in front of so many people has been a trigger to overhaul my bodycare routine, or lack of. I made a couple of changes to my routine and I’ve noticed a big different in my skintone over the last month or so, my skin looks a lot brighter, more even and I’m sure some of my scars have faded. The important thing is, I altered my daily routine so I paid attention to my skin every single day – I’m sure this is the only reason I’ve seen such a difference. 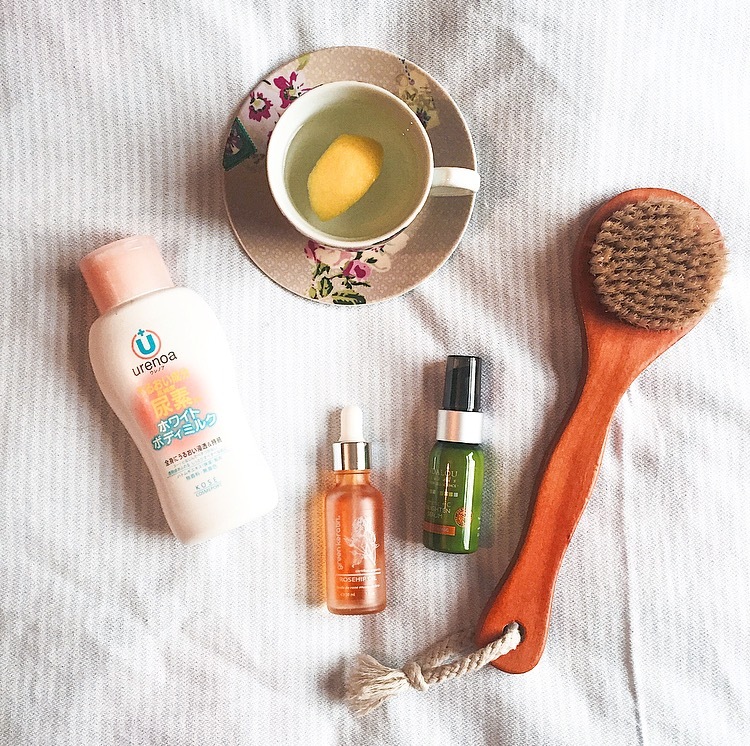 I wanted to share my top four tips for giving your skin some daily TLC. -Buy a natural bristle body brush, mine is from The Body Shop. -Start at your feet and brush in the direction of our heart. Drinking hot water and lemon every morning is essentially a little detox every day. Lemons are an alkaline food so they help to balance your body’s pH level – our bodies tend to be quite acidic so it’s important to eat a more pH balanced diet. It also helps to wake up the liver and thus flush out any toxins from the inside – while body brushing works to eliminate toxins from the skin. Hot water and lemon is also good for digestion as it helps to improve the body’s ability to absorb nutrients. The upshot is that your body will be carrying less toxins andabsorbing nutrients better which means healthier, clearer skin. Although it hasn’t helped to fade any of my marks or scars, but it’s helped stop any new ones forming and has given my skin a glow. I am utterly obsessed with Korean and Japanese beauty brands, they are just so much more advanced than the brands available here. When I was in Hong Kong a few years ago, I tried a few brands at Sasa which is a huge cosmetics store and I’ve managed to find a few shops in Chinatown which sell the same products. Now, a whitening body cream might sound scary but they don’t dramatically whiten your skin at all, they have more of a brightening effect rather than anything else. Urenoa’s whitening body cream is quite runny in consistency so I used it in the morning after my shower, it absorbed super quickly. I feel like my skin has been a little brighter and more even after using it for a month. Rosehip oil is basically a miracle in a bottle. It’s rich in Omega 3, 6 and 9 as well as Vitamins A, C and E making it an absolutely essential part of your skincare routine. The essential Omega fats help reduce scarring and promote skin regeneration as well as improving skin flexibility and aiding repair. Vitamin A helps to improve skin texture and tone so it’s also great for helping to fade scars and discolouration. Vitamin C helps to stimulate collagen and reduce fine lines and wrinkles. Although rosehip oil is a ‘dry oil’ and absorbs very quickly, I only applied it at night. While it’s a well-known skincare oil – apparently Kate Middleton is a fan – I applied it to my whole body. My skin absorbs the oil super quickly and a couple of drops really do go a long way. My skin instantly feels soft and nourished, and it even feels this way in the morning. I have definitely noticed a huge difference since I started using it. It’s a pretty pricy body oil at £16.50 for 20ml but it’s made such a big difference I can’t not use it.